BMCCNY was formed about 2001. 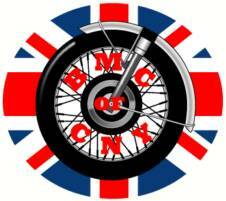 The club is a great group of men and women whose passion for British machinery grows. We are connected by our email list of over 100 members and through meeting at local events. If you would like to participate in the club, visit the Membership Form Page to be added to the mail list. Tell us a little about yourself and your interest in Brit bikes. We would like to hear from you. If you are interested in taking a more active role tell us what you would like to do for the club. Visit our Links Page to learn about other British and European clubs in NY State. We stay connected by email newsletter. The NY State Brit/Euro/Vintage Events Calendar is your key to what's happening in the classic motorcycle world in NY State. Just click on the nav link above to find current events, dates and info. The calendar has begun updating for 2017.